Fifteen years ago, a neighbor came to my door, asking me to watch her son. She had three young children all under the age of six, and was on her way to court. Her husband had left her for another woman, and refused to sign off on their home so it could be sold. Her job alone was not enough to pay the mortgage, and he would have received a portion of the proceeds in equitable distribution. The husband also rarely complied with child support, which would have been reduced had he cooperated in the sale of the property. The home was in foreclosure, however, for no other reason than the misconduct and bias of the judge. He was focused on providing hourly fees to repay campaign contributions, to the fellow bar association member that represented her husband. My neighbor could not afford an attorney, and was representing herself. Ironically, fifteen years later, I had the same judge preside over my own divorce. It has been eight years, and I too, have had to represent myself. The same things have happened to me. My home is needlessly in foreclosure over a simple signature for a modification of the mortgage. Judge Kelly Wall, in Montgomery County, was indebted to the bar for campaign contributions. She let a motion for relief go unaddressed for four years, and failed to disclose it on the Rule 703 reports, which require them report timely disposition of issues. After four years of contacting the Judicial Conduct Board, I managed to get a meeting with them. They did force her to recuse, but apologized that they have no restitution mechanisms. My anger is not so much with my revengeful spouse, as it is with the people who are being paid to control these situations. Maybe if I had gotten involved fifteen years ago, with trying to repair our severely decayed justice system, I would not be now battling for eight years, still not even divorced. Whether you are involved in family court or just a plain civil matter, the problem is all from the same source. No checks and balances over the Judicial Branch. They are directly responsible for all of the government corruption we are seeing. So I understand the apathy; but I cannot understand when those that are involved, how they still do not participate in trying to stop this from happening to their children in the future. It took Martin Luther King, Jr. over twenty years, to get enough people to actively participate in the civil rights movement of the 1960’s. This is where our trouble with the courts began. You can learn about it here. Since that time, the bar associations increased their power over the courts, to take away those rights that were fought for during that time. There is a lot of information on how this occurred on Pennsylvania Court Watch – it regards the Open Meeting Laws and Sunshine Act. But in the interim, I have an historical case – one that no one in the state of Pennsylvania has had as much success on, in suing the opposing attorney in my divorce. If I prevail, it will set precedent for others to use. The reason I was able to get as far as I have, is because ONE judge, did not take campaign contributions, and is not subservient to the bar. For the last four years I have been in litigation against this attorney and it has given me valuable information that I would like to share. Last week, the defendants attorney made a mistake. He filed what is known as a Motion for Reconsideration, for dismissal of his preliminary objections, by the first judge, from years ago. When he did this, under the collateral judgment doctrine, the decision process went back to the first judge, who had been removed from the case after she allowed my case to move forward. The current judge, who took a large amount of campaign contributions, has been allowing the defendants to use dilatory tactics, and drag the case out for the last three years. The first judge denied their attempts to dismiss the case again. and it gave me something invaluable. She wrote an opinion, which gives the Pennsylvania Law, to sue an opposing attorney for abuse of process. Only about a dozen states in the country provide for this. You can view the law on the site here: Order of Judge on Attorney Abuse of Process. Use it in your own case; maybe if enough people sue the opposing attorneys, it will help end judicial corruption. Who Is Behind The Destruction Of The American Constitutional Republic? Corrupt Lawyers (Activist Judges Included). Against the explicit warnings of the American Forefathers, such as James Madison, in some of the most famous of The Federalist Papers, 47 and 51, we have let one group of people take control of all branches of government. Attorneys through their BARs have taken control of all the powers of American government with catastrophic results to this nation as attested by anyone seeking justice in our current judicial system and as evidence shows. “The accumulation of all powers, legislative, executive, and judiciary, in the same hands, whether of one, a few, or many, and whether hereditary, self-appointed, or elective, may justly be pronounced the very definition of tyranny” Federalist # 47. As a matter of fact, the Florida Constitution in Article 2, Section 3 is clear about attorneys working for the judicial branch being prohibited from working in other branches of government: Branches of government—The powers of the state government shall be divided into legislative, executive, and judicial branches. No person belonging to one branch shall exercise any powers appertaining to either of the other branches unless expressly provided herein. The political turmoil we are witnessing today in America and in many other countries around the world is a repeat of the cycles described by Greek philosophers over two thousand years ago. See: http://www.votefamily.us/understanding-the-cycles-of-governments/, http://saynotopas.com/understanding-government-cycles-and-how-to-remain-in-a-democracy/. The solution to restore America’s Constitutional Republic, although may seem painfully slow, requires that regular people, non-attorneys run and win legislative and executive offices all over this nation. This is why President Trump’s victory was so important to save the American Republic. Now, take a look at who is mainly obstructing, and attacking President Trump every step of the way: The Clintons, the Obamas, James Comey, Mueller and his Trump-Russian witch hunt team, and many other whose professions are? You guessed it right: attorneys. Perhaps the best gauge for the great dislike of the legal profession for President Trump is to look at how much money this group donated to the Clinton vs. the Trump campaign. Lawyers and law firms donated $36.4 million to Clinton, but sent only a fraction of that, $0.94 million, to Trump. Wow, that is 3,872% more money donated to Clinton’s than to Trump’s campaign. No wonder President Trump is being attacked so fiercely by lawyers, and the elite in general. We certainly hope to see more non-attorneys run in many other races making sure lawyers stay where they belong, in the judicial system. Furthermore, ever increasing dishonest and unethical behavior among lawyers proves that the profession can no longer regulate itself, and legislators must step in to take away this authority in order to protect the public. Attorney bars are doing a horrible job regulating the profession. Valid complaints against attorneys committing fraud upon the courts and even lying to their clients are routinely ignored, as illustrated by countless examples such as Dr. Jimenez’ case here http://www.SayNoToPAS.com, while honest attorneys who stand for clients’ rights are routinely disciplined and/or disbarred. See: COMPLAINT FOR CAUSES OF ACTION ARISING UNDER FEDERAL RICO AND ANTI-TRUST LAWS, AND CLASS ACTION against Florida BAR, its “voluntary” dismissal. “The germ of destruction of our nation is in the power of the judiciary, an irresponsible body – working like gravity by night and by day, gaining a little today and a little tomorrow, and advancing its noiseless step like a thief over the field of jurisdiction, until all shall render powerless the checks of one branch over the other and will become as venal and oppressive as the government from which we separated.” – Thomas Jefferson, 1821. 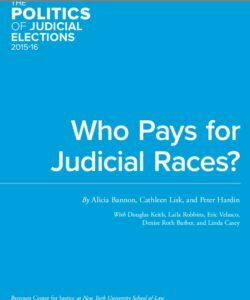 Previous PostWhy Self-Recusal Cannot Remedy the Influence of Campaign Contributions on Judges’ DecisionsNext PostAre The Inmates Running the Asylum In Your State?